So the three of you who read this blog might be wondering why I haven’t been posting much lately. Where’s Jeff, the cloud praxis guy & Hyper-V fanboy, who says IT pros should practice their cloud skills? you might have asked. Well, I’ll tell you where I’ve been. One, I’ve been working my tail off at my new job where Cloud Praxis is Cloud Game Time, and two, the Child Partition, as adorable and fun as he is, is now 19 months old, and when he’s not gone down for a maintenance cycle in the crib, he’s running Parent Partition and Supervisor Module spouse ragged, consuming all CPU resources in the cluster. Wow that kid has some energy! Yet despite that (or perhaps because of that), I found some time to re-think my storage strategy for the Daisetta Lab. It doesn’t make me choose between file or block storage, and is object-storage curious. It can even do NFS or SMB 3…at the same time. It’s combining three storage chipsets -the LSI card, the Supermicro’s Intel C226, and ASMedia 1061- into one software-defined logical system. It’s abstracting all that hardware away using pools, similar to ZFS, but in a different, more sublime & elegant way. It doesn’t have the ARC –ie RAM AS STORAGE– which makes me really resent it, but on the plus side, I’m only giving it 12GB of RAM and now have 16GB left for other uses. “Do I need that much?” is like asking “Does ‘Merica need to stretch from Sea to Shining Sea?” No I don’t, but yes ‘Merica does. But I had these drives in stock, as it were, so why not? But seriously, under load, it’s hitting about 310 watts. At idle, 150w. Not bad all things considered. 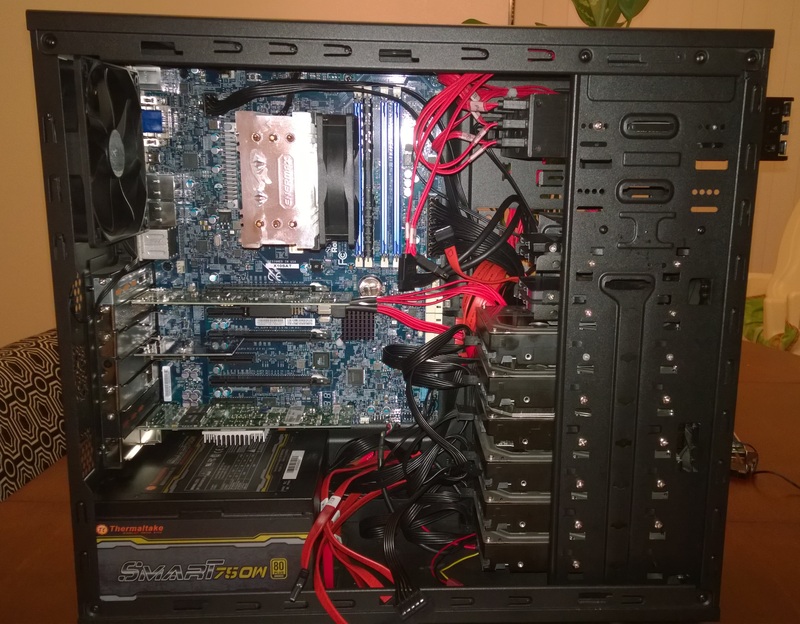 Haswell + full C states & PCIe power management work. It’s built as veritable wind-tunnel as it lives the garage. In Southern California. And it’s summer. Under load, the CPU is hitting about 65C and the south-bridge flirts with 80c, but it’s stable. It has six, yes, six, 1GbE Intel NICs. Two are on the motherboard, and I’m using a 4 port PCIe 2 card. And of course, I’ve enabled Jumbo Frames. I mean do you have to even ask at this point? It uses virtual disks. Into which you can put other virtual disks. And even more virtual disks inside those virtual disks. It’s like Christopher Nolan designed this storage archetype while he wrote Inception…virtual disk within virtual disk within virtual disk. Sounds dangerous, but in the Daisetta Lab, Who Dares Wins! So yeah. That’s what I’ve been up to. Geeking out a little bit like a gamer, but simultaneously taking the next step in my understanding, mastery & skilled manipulation of a critical next-gen storage technology I’ll be using at work soon. Stay tuned. Full reveal & some benchmarks/thoughts tomorrow. and all the packets and flows are players. Let’s take a step together into a place unfamiliar and dark. A place that is, by all rights, strange and bewildering. A little place I like to think of as just one order of magnitude less rational than the Twilight Zone…a place few understand, and even fewer have mastered. A place just beyond my gateway, a place I really don’t care about except when I do, a place I like to call, the Wide Area Network. That’s right. Let’s talk about the next hop. The land of BGP and OSPF and NAT and VPNs and QoS and CoS and DSCP and the “Goddamn ASA” and static routes and the “Goddamn firewall” all these words, phrases and acronyms you heard once, but dismissed as just so much babble out of the networking guy’s mouth, the one guy on your team who seems to age faster than all the others. Hell, if it were up to you, Mr. Storage Networking Engineer, you’d do some LACP trunks or hook up MPIO up to that WAN and call it a day, amiright? I mean what’s so complicated here? Of course links go down, that’s why teams (and virtual teams-of-teams!) are so cool! But alas, all the world’s not a storage array, and all links to it are not teamed GigE interfaces with sub-millisecond latency. And your business WAN, particularly the links to/from remote sites that comprise the RFC-1918d, encapsulated, virtual private wide-area network your typical mid-sized business with a large footprint depend on, fail far too often. Or at least they have for me when I look back and survey the glories & wreckage of my 15 year IT career. Verily I say unto you, the WAN is my White Whale, and I am an IT Ahab. Multiprotocol layer switching (MPLS): The go-to solution for WAN pain, particularly for businesses that can’t/won’t employ a networking wonk equal to Mr. Ivan Pelpjnak. MPLS is a god-send for some firms, but it’s very costly. To really get value out of an MPLS strategy, you almost have to couple it with a session vritualization or in-datacenter-computing model (XenApp, RDS, VDI etc). Why? While MPLS makes the WAN as reliable and as accessible as your LAN, it doesn’t defeat latency. And latency is a hard thing to explain. Go on. Try it. On your spouse or significant other. MPLS part two: And just so that I can get it off my chest…when the primary link at a branch site does go down, why do MPLS providers have such a hard time failing over to a secondary? I mean for real guys? Just keep the secondary WAN/VPN link up, or do something fancy with VRRP or VARP or something. Without a failover link, a downed-MPLS is worth less than a regular commodity internet circuit. MPLS part three: In previous roles, I worried that maintenance of the MPLS became an end unto itself. I can see how this would happen, and I’ve been guilty of it myself; sometimes IT guys think in IP addresses, when they should have an eye to the future and think in FQDN, as the former is and shall forever be not routable, while the latter is the future. Underlining this point is the argument (well-supported in 2014, I think) that MPLS is, at best, a transitional technology. Build your business on it if you have to, but don’t tie anything to it, in other words. Sure it’s cloud-compatible, but so is dial up. Inline Compression/dedupe: As a storage networking nerd, I Heart me some Riverbed and SilverPeak. But those are tools on the WAN that, in my experience, are just one CapEx ask too much. I’ve never actually used one of them. Love the idea, can never justify the cost. Open source alternatives? There’s really none (Except for this brave guy), speaking, perhaps, to how sophisticated and well-engineered these devices are, which justifies their cost but also makes them unobtainable for SMB shops. Pertino and the like: I’ve been a fan of Pertino since I first started using this “Cloud VPN” product, which I likened more to a Layer 2 switch in the sky than a traditional VPN service. It’s some great tech; not clear that it can scale to 100s and 100s of users though. But very promising nonetheless, especially for really small but geographically-diverse environments. Link aggregation + VPN all in one device: If you’re going to go hub & spoke because MPLS costs too much, or you can’t quite do full-cloud yet, this is a promising strategy, and one I’ll soon be testing out. I know I’ m not alone in the WAN-is-my-white-whale meme because companies like Peplink, Talari Networks, and even Cisco are still building products that address WAN problems. I have used Peplink before; was impressed, would use again, want one in my home with a second internet line, A+++++. The only thing that scuttled wider adoption in my last role was voice, a particularly difficult problem to sort out when you slap some good ol’ LACP-style magic onto your WAN ills. These devices, ranging from a few hundred bucks to several thousand, are almost too good to be true, as they tell the IT Pro that yes, he can have his cheap but rapidly-deploy-able commodity internet circuits aggregate into one, high speed, fault-tolerant link, and yes, that “unbreakable VPN” (as Peplink dubs it), can connect back to the HQ. Doesn’t defeat latency, true, but it sure makes the ASA look old-hat doesn’t it? Cloud: The default winner, of course. But OpEx is hard to quantify. Sure, I guess I could up and move my datacenter assets to a CDN and let the network take care of the rest, or I could stand up a VM in a datacenter close to my users. But replication to on-prem assets/sources can be difficult, and, in some ways, in a really wide WAN, don’t we start worrying about version control, that what the New York branch is looking at is the same as the Seattle branch? Even so, I’m down with it, just need to fully comprehend it first.